My family and I have come up with a lovely solution for all the old, unused baskets we have around the house -- bird feeders! We discovered that little birds like chickadees latch onto the sides to peck out their meal while bigger birds love perching on the top. 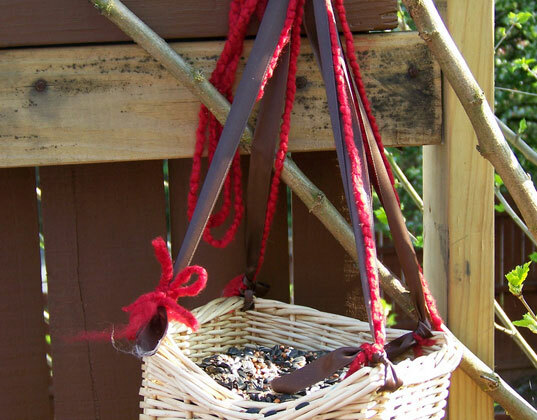 Follow our easy how to instructions to make a basket bird feedee for your backyard. 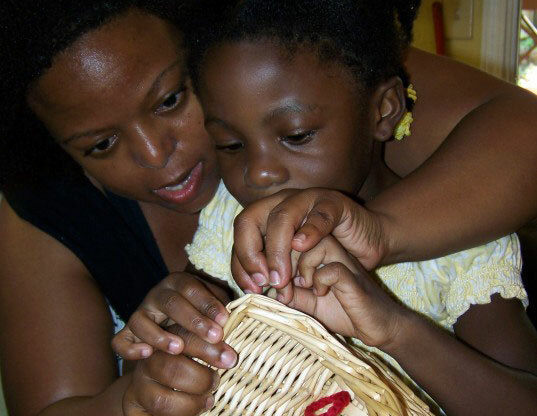 First, scavenge around your home for an old basket that no longer serves a purpose in your home. Larger baskets can be advantageous because they hold quite a bit of feed. You’ll also sturdy ribbon for hanging your feeder and thinner decorative ribbon or thread to give your feeder style. Finally, gather a Popsicle stick or chopstick to use as a tool. Cut four 24-inch long strips of a sturdy ribbon. You can also add decorative ribbon, like the red ribbon shown above–it may not be as strong, but it is pretty, adding something special to the feeder. 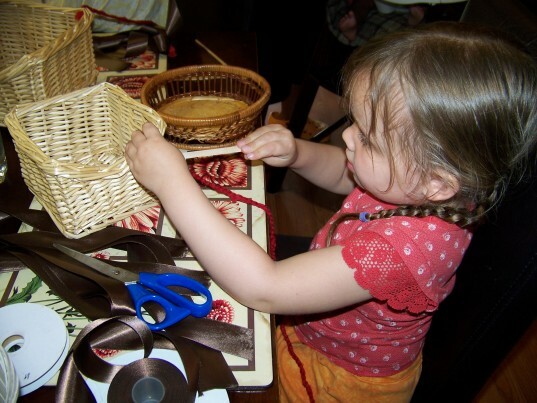 Use a chopstick or Popsicle stick to push the ribbon through each corner of the basket. Tie the ribbon to secure it at each corner. If your kids complete this step, go back after they’re done to make sure all the ribbons are tied tight and knotted in the four corners. 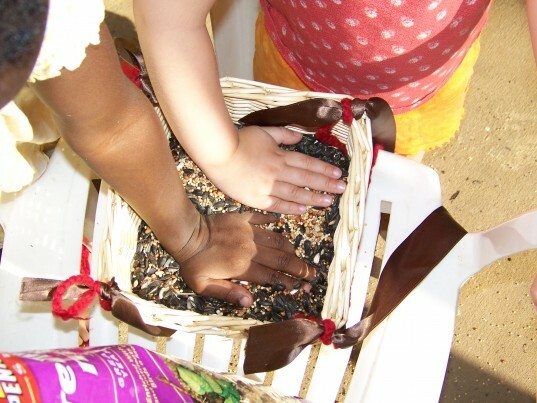 Pour bird seed into your basket, being mindful of the feeder’s weight. Depending on the size of the basket and the sturdiness of the branch you plan to hang it on, you may not want to fill it to the top. 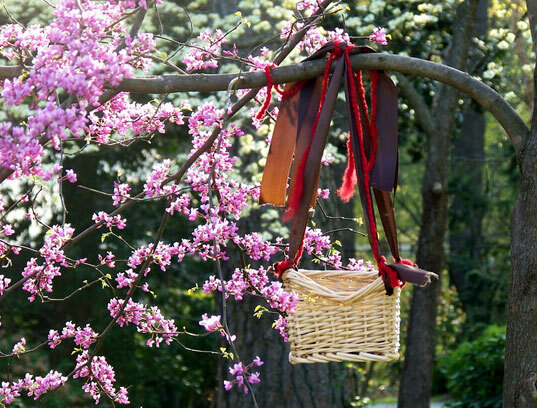 Find a tree branch sturdy enough to support the weight of the filled basket. Then, gather the ribbons from each of the four corners, and loop them around the branch so you can tie them together at the top to hang the basket. Gather Your Supplies First, scavenge around your home for an old basket that no longer serves a purpose in your home. Larger baskets can be advantageous because they hold quite a bit of feed. You'll also sturdy ribbon for hanging your feeder and thinner decorative ribbon or thread to give your feeder style. Finally, gather a Popsicle stick or chopstick to use as a tool. Attach the Ribbon Cut four 24-inch long strips of a sturdy ribbon. You can also add decorative ribbon, like the red ribbon shown above--it may not be as strong, but it is pretty, adding something special to the feeder. Use a chopstick or Popsicle stick to push the ribbon through each corner of the basket. Tie the ribbon to secure it at each corner. If your kids complete this step, go back after they're done to make sure all the ribbons are tied tight and knotted in the four corners. Fill it Up Pour bird seed into your basket, being mindful of the feeder's weight. Depending on the size of the basket and the sturdiness of the branch you plan to hang it on, you may not want to fill it to the top.